Provides Sun Protection Factor (SPF) of 15. The combination of physical and chemical sunscreens offers broad protection against UV-A and UV-B rays. Contains lactic acid, found naturally in the skin, as a moisturiser and also offers assistance in improving the appearance of uneven skin tone. First apply your recommended Environ vitamin A moisturiser. 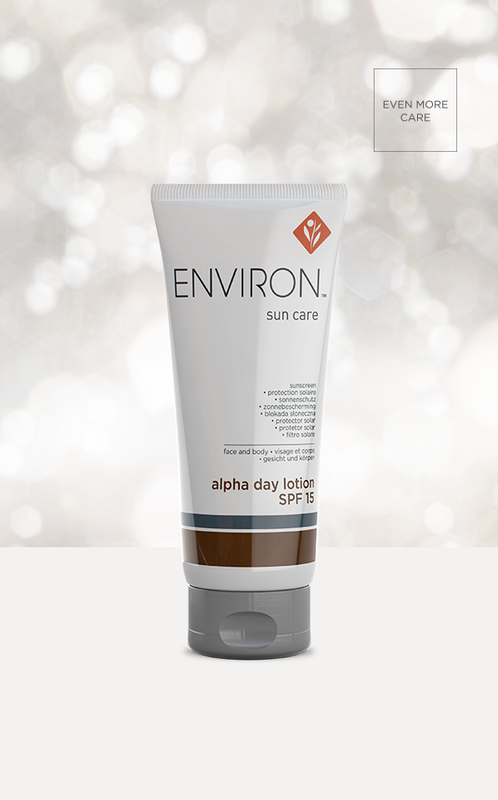 Then apply Alpha Day Lotion in an even layer to face, neck and décolleté and all areas exposed to the sun. Reapply frequently, every 90 min to 2 hrs to achieve optimal protection. May appear opaque if applied thickly, but this will provide even better sun protection.